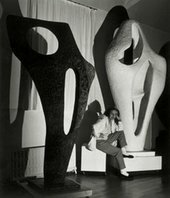 How has Barbara Hepworth influenced contemporary artists working across sculpture, collage, film and performance? With chair Fiona Candlin, the artists Linder Sterling, Alice Channer and Charlotte Moth discuss how Hepworth’s love of dance, her engagement with the landscape and approach to merging with her artwork have been inspirational for their own varied practices. Linder (Sterling) was born in Liverpool. Apart from her practice as a visual artist, Linder has also been active as a musician and a performance artist. For her recent exhibition at The Hepworth Wakefield, Linder drew on her research into Barbara Hepworth to create a major new performance piece entitled The Ultimate Form. She is currently rehearsing a new work with Northern Ballet which includes a character based on Barbara Hepworth. Alice Channer is a sculptor who lives and works in London. Channer completed a BA in Fine Art at Goldsmiths College, and an MA in Sculpture at the Royal College of Art. She has exhibited widely and her work is included in the Arts Council Collection, Tate Collection, and the Zabludowicz Collection. Charlotte Moth was born in Carshalton, UK, and currently lives in Paris. Having studied at the Kent Institute of Art and Design at Canterbury and Slade School of Art, Moth is in the process of completing her PhD at the Royal College of Art. Moth’s Choreography of the Image, inspired by a photograph taken in 1937 by Barbara Hepworth, is currently on view at Tate Britain. Fiona Candlin is Senior Lecturer in Museum Studies in the History of Art department at Birkbeck University. During 2005-7 she was Visiting Professor at the KonstLab studio programme at Gothenburg University, Sweden. In 2010 she published Art, Museums and Touch examining conceptions and uses of touch within art museums and art history, questioning its association with female identity and sexuality.